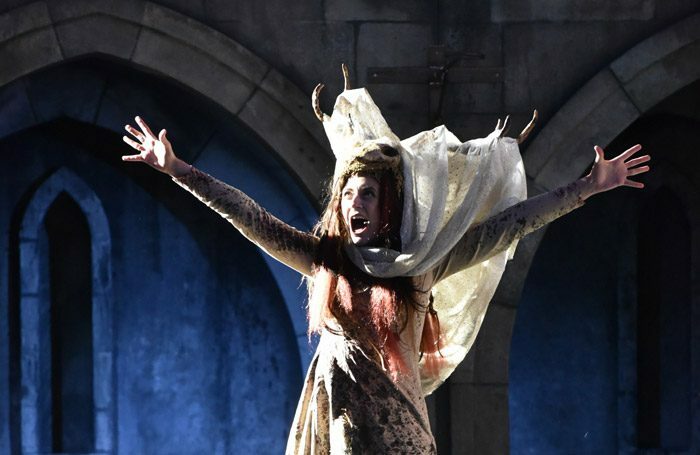 This year’s Stafford Festival Shakespeare production provides a breathtaking insight into the Scottish medieval world. Designer Simon Kenny’s castle ruins blend brilliantly with the real shell of Stafford Castle, below which the action plays out in the open air. From the start, the music and lighting create a suitably menacing mood. Director Clare Prenton has taken a “back to basics” approach, taking the Scottish play back to its historical roots and delivering something that is forceful, accessible and refreshingly honest – even including a rarely staged Hecate scene. Its Scottishness plays a key part. As well as bagpipes and drums, a live falcon and the use of well-researched fabrics, most cast members hail from north of the border, all of which gives it a truly authentic feel. Music director David Hewson’s stirring compositions are an added delight. The whole cast give performances that match the quality of the staging. Rosie Hilal’s Lady Macbeth is subtle and nuanced; a total water immersion for the “Out, damned spot!” scene draws gasps from the audience. Morgan Philpott and Daniel Cahill are particularly impressive as Banquo and Macduff, while Bil Stuart brings an exciting, youthful vigour to the title role, delivering a powerhouse performance in which the contrasting moods of his complex character are always convincing. As the production ends, lighting effects are beamed onto the castle and as the audience departs, a lone piper plays on the embankment, creating a truly memorable image.